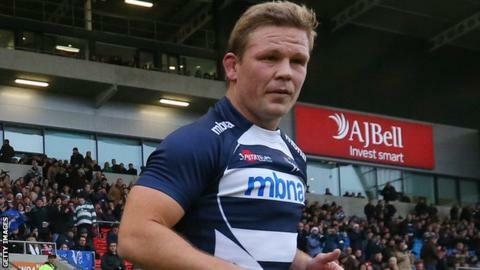 Sale Sharks captain Dan Braid has signed a new one-year extension that will include a player-coach role for next season. The 34-year-old former New Zealand back-row forward's contract was up at the end of the season. Braid moved to Sale in January 2013 from Auckland Blues and replaced Dave Seymour as captain later that year. "Coming to Sale has worked out far better than even I could have imagined," Braid said. "When I arrived I was only on a six-month contract and I was playing for my career to be honest. "I'm delighted to have signed the new deal to carry on playing and also to know that I'll be involved on the coaching side going forward." Braid, who had a year at Queensland Reds in 2009, also played for the New Zealand Maori side in 2005. He has been an integral part of the Salford-based Sharks side since he moved to English rugby, scoring 15 tries in his 49 appearances. He becomes the latest Sale player to commit his future to the club, with Tom Arscott,Jonathan Mills and Sam Tuitupou all agreeing new deals in recent weeks.